Karelia is the land of hunters, fishermen and skillful craftsmen. Till today local crafts play an important role in the lives of local population. In the centre of Karelian culture you will learn Karelian crafts and make your own souvenir using traditional patterns, try national tea and pies. Afterwards you will experience dog sledding. The eyes of husky dogs are blue and deep like the clear sky in a frosty day. They are so friendly, that you will immediately become friends forever. 09:00 Meeting with the guide. Transfer to Pryazha (50 km from Petrozavodsk). Upon arrival excursion in the centre of Karelian culture and workshop on Karelian prints. You will get acquainted with Karelian symbols of love, well-being and happiness. Using these symbols you will create your own pattern and decorate a blank shopping bag with the print, which you have designed. This bag will be a nice unusual souvenir from Karelia. While the pattern gets dry, you will taste herb tea with Karelian pies. 13:00 Arrival in the husky farm. 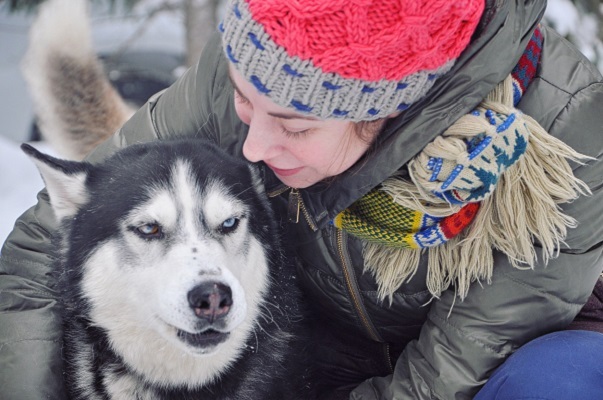 The musher will acquaint you with the history of the breed and safety measures. Afterwards you will see, how the dogs are harnessed. If you feel like joining this process, you are welcome to help the musher. After the dogs are ready you will enjoy a 3-km ride in the winter pine forest.